Staying healthy when traveling today is essential. From hotel bed bugs and synthetic cleaning products to recirculated air and flame retardants in airplanes, we must take a proactive approach to, not only staying hydrated, but avoid breathing in toxic chemicals, bacteria, viruses, germs, dust mites and fungi. While that may seem out of reach, these five solutions are sure to make your next trip a (Tahitian) breeze. 1.) Use a Personal Air Purifier – On the plane, train or even in your hotel room, circulated air can be toxic and extremely bad for your health. Meet your new travel mate – the AirTamer by FilterStream is the world’s most effective personal rechargeable, personal air purifier. It’s a small, portable, personal air purifier that cleans your air by removing airborne pollutants (e.g. viruses, bacteria, pollen, dust, etc.) away from your personal space allowing you to breathe cleaner, healthier air everywhere you go. Over 2 million negative ions are emitted from that brush every second. These negative ions attach themselves to air particles like allergens, viruses, etc. in the air and negatively charge those particles. You can wear it around your neck (strap included) since it is smaller than most MP3 players – or place it freely on your nightstand so the air around your pillow is clean and free of pollutants. The next time you check into a hotel, you’ll be breathing a sigh of relief! 2.) BYOP – Bring Your Own (Organic Travel) Pillow – The eewwww factor of hotel pillows is, well, off the charts. With over 20 Million Americans suffering from dust mite allergies today, according to the AAFA, it is the most common indoor allergen. Most hotel rooms, carpet, and sofas are havens for pet dander and dust mites. Due to warm temperatures and moisture released during sleep, your pillow becomes a perfect breeding ground for dust mites, bacteria, germs and fungi to thrive. A study from the University of Manchester revealed the average pillow can contain millions of fungal spores, with four to 16 different species per pillow. 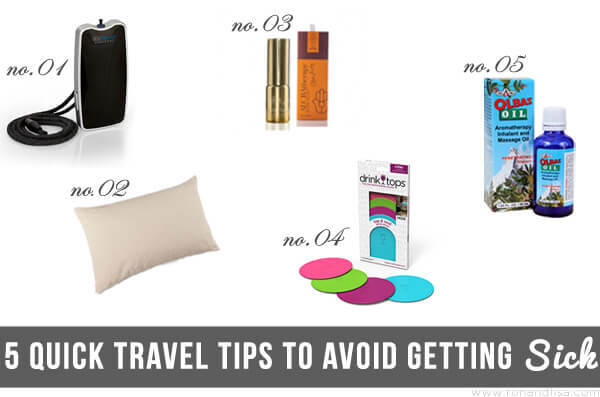 Instead, bring your own organic travel pillow with you to use on the plane or in the hotel room – I do! 3.) Freshen & Feng Shui Your Hotel Room – How about some feng shui upon check in? Keep your mood in balance anytime, anywhere with aromatherapy. Mood Boost on the road and Room Boost are perfect when you check into your hotel destination. Room Boost Sprays are unique and expertly formulated sprays made with organic ingredients designed for home and on the go. These versatile mists are a must have for harmonious home, travel and more. Mood Boost Sprays let you try on many personas and explore your unique qualities with expertly blended 100% natural and organic essential oils offering natural aromatherapy fragrances. Choose from Seductive, Beautiful, Smart, Balanced, Inspired, Peaceful, and Awake Travel size Mood Boost. BONUS: ADORAtherapy products are Certified Vegan, Cruelty Free and made in the USA. 4.) Create a No Fly Zone – No, really. While sipping that glass of chardonnay at the airport bar, a small fruit fly can quickly ruin the travel mood. Aside from the unpleasant prospect of swallowing a bug, the alcohol in the wine softens the fly’s body and it releases a nasty-smelling enzyme into the wine. Plus, fruit flies carry diseases, bacteria and viruses. Instead, use Drink Tops – they’re BPA-free covers made from silicone; the wine version even offers a mesh top so your wine can breathe (and so can you). 5.) Treat Prevent Colds & Allergies, Naturally – Say goodbye to nasty cough syrup and sugar-laden cough drops. Instead, stay healthy naturally with the power of essential oils! Olbas Oil is extracted from the traditional medicinal plants of Peppermint, Eucalyptus, Cajuput, Wintergreen, Juniper Berry and Clove. Prevent and protect yourself and your family from colds and allergies along your travel path. Choose our number one go-to for staying healthy at home and on the road with all-natural Olbas Aromatherapy. They have every solution for your need including: Inhalers, Olbas Oil, Olbas Salve, Olbas Herbal Tea, Olbas Sugar Free Lozenges, Olbas Bath, Olbas Pastilles, and Olbas Cough Syrup. Plus, they smell and taste truly divine. There you have it – five surefire ways to avoid getting sick while traveling that we personally use and rely on. Got a favorite? Let us know in the comments below. Now, sit back, relax and stay healthy!